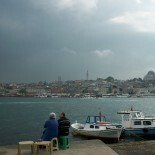 See you Monday for a happy tale from the Ataturk airport, Istanbul. For now, a few lines from John Steinbeck’s “The Winter of Our Discontent,” which I just devoured. 🙂 Three sections of the book. Out of order. Just lovely lines to savor. …I thought of the most feminine story I ever heard. Two women meet. One cries, “What have you done with your hair? It looks like a wig.” “It is a wig.” “Well, you’d never know it.” Maybe these are deeper responses than we know or have any right to know. Some people resent awakening, but not Mary. She comes to a day with expectancy that it will be good. And, knowing this, I try to offer some small gift to justify her conviction. In case it is very hot where you are, here’s an image of Iceland in March. Oh, Paige, I have never read this work of Steinbeck’s but will have to. Gorgeous excerpts! this photo is so beautiful….and i bet its cold too. Iceland in March was like being on the moon. A real photographer would have found ways to capture it beautifully, while I mostly caught it accidentally. 🙂 Nonetheless, thank you. I love this photo. This entry was posted on August 5, 2016 by thenicethingaboutstrangers in Literature, love stories, Travel and tagged beautiful writing, john steinbeck winter of our discontent, literature.